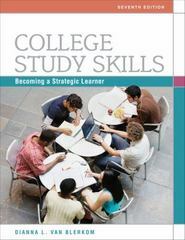 College Study Skills 7 Edition COLLEGE STUDY SKILLS: BECOMING A STRATEGIC LEARNER, Seventh Edition, is a wide-ranging, practical text that focuses on helping you become actively engaged in your own learning. The text incorporates active learning strategies to help you succeed in college by introducing a strategy, allowing you to practice it, and asking you to do self-assessments to gain feedback on your own success. This variety of strategies and activities, as well as authentic and engaging text material from numerous core subject areas, gives you opportunities to apply what you are learning to your course work in other college classes. The Seventh Edition has a new focus on motivation. Chapter (1), "Getting Motivated," focuses on the importance of motivation in college success. More information on the causes of motivation problems and strategies for increasing motivation are included. Each of the chapters that follow in the text strengthens the connection between motivation and the strategies that are presented, so that students continue to increase their motivation through-out the course.